It's the start of 2017 and it has got very cold. It is only 6th January today and so far so good, I've had two days at work and although I was feeling I didn't really fancy going back it was okay really, other than getting freezing cold feet. Mr P is still off work so it's a bit random him being home and me having to go out to work. We brought in the New Year at home watching a TV programme in bed and Little Miss P fell asleep by 11:00, but we were out the night before in a lovely hotel room. It was very late and so I called it my New Year... I just had it a day early. 9th January - We went to Woodford panto like we have been doing for the past five years and this year was Beauty and the Beast. 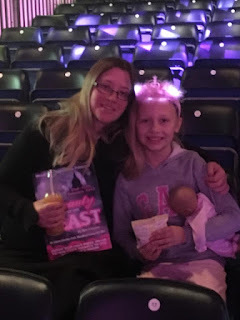 Little Miss P loved it more this year due to some of the girls in it being from her dance school and she loved watching them. As I do every year I will be doing a review on it (if I haven't done so already). Also I went back to my mum's house and had a lovely roast dinner. 14th January - Not much else has been going on other than going back to work/school, dancing and just back to normal. We have had some snow the other but it was all ice in the morning and couldn't make any snowmen but due to the ice I did get to get Little Miss P from school a tiny bit early. eBay is going well so far and I have sold something every week so far so I really hope that will keep going. 19th - Last night we booked Little Miss P's first music exam, it's her singing prep test. It's not really an exam it is just putting them in an exam situation and see how they cope so that they know what to expect when they do their first Grade One exam. I think she's a little bit nervous but excited at the same time. It's now the last day of January and it's be fun. Work has been very cold and I have had to wrap up warm, but the last few days wow, I felt like crying because my face was so cold. I can't wait to see what February will bring.